Shar-Baby was born Sharon Baylock on January 18th 1952 in South Bend, Indiana and grew up in The Prospects. Her father, Alex Baylock, was a gospel singer and between 1940-50 sang with the Lambs Quartet and the Revelations and gave his daughter a love for music and singing. His greatest moment was playing on the same bill as Sam Cooke and The Dixie Humming Birds. Meanwhile, her mother was an R&B/Blues fan and constantly played blues records in the house by Wolf, Muddy, Reed, Big Mama Thornton, Slim Harpo, Brook Benton, Wilbur Harrison, K C Douglas ect. Sharon decided that she wanted to play the guitar and her parents paid for lessons. Her second guitar teacher was taken by her vocal prowess and asked her to join his band the �Checkmates Pt.2�. A year later she formed her own band the �Soul Sensations� with bass player Elmo Perry � a school friend, and after that she and her sister Marilyn � also a singer � formed a group with a couple of girls from school and they gigged around South Bend for the next fifteen years. She also played with Lonnie Woods who worked with Junior Walker and The All-Stars. Around this time Sharon�s aunt who was living in Chicago and worked at the Zanzibar Club, whilst dating Little Walter, visited her sister and began calling Sharon �Shar-Baby� and the name stuck. In 1991 she married her second husband, Jim Newport, who became her manager and they moved to Pensacola, Florida. Here she was interviewed by Bob �Blues� Hills� on WRNE and her appearance led to more work and further radio interviews including the College Campus Blues Radio in Detroit, where the Big City Blues Magazine editor heard her for the first time and wrote an enthusiastic article on Shar-Baby in October 2005 which fascinated me. I telephoned Sharon and she sent me a CD which was self-made and badly cobbled together. Still, there was something and I did send a copy of the CD to Big Joe who wasn�t completely damning, but by then I was off the boil and looking for a band to back Frank Ace and Wallace Coleman. In May this year I went for a break in Spain and met up with Kathleen Pearson-Thomas for a spin in her car and a fish supper. Talking blues and lady artists she suddenly came up with Shar-Baby who she had met at the Coin Festival up in the mountains near Malaga. Apparently she was very impressed by Shar-Baby�s performance but I was still reticent. On my return to England I found the latest Blues in Britain Magazine waiting for me, with an enthusiastic write-up for Shar�s Coin debut. 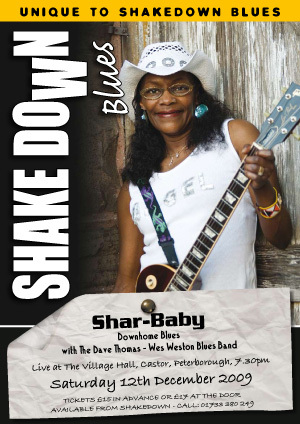 Two days later an envelope from Mike Stephenson of Blues and Rhythm arrived extolling her virtues at the Willie King Down-Home Blues Festival in Arkansas �she was the best artist at the festival and sold loads of CD�s�. Her latest CD was enclosed and on it the band backing Sharon was energetic, competent and more to the point there was a sparkle in her voice. This was obviously what excited Robert Jnr Whittle in 2005. Another couple of �phone calls and we had our December slot filled with Shar-Baby backed by Wes Weston, harmonica; Dave Thomas, guitar; James Goodwin, piano; Orlando Shearer, upright bass; and Mike Thorn, drums. This outstanding line-up together with Sharon�s rhythmic guitar should get us into the Christmas spirit.